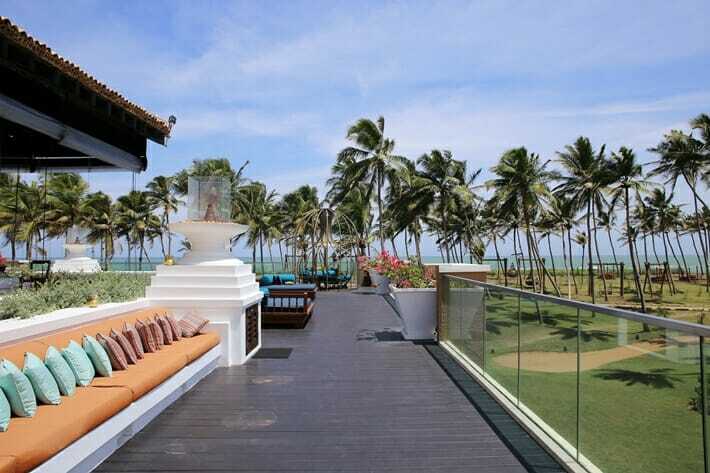 An incredible luxury property to check out in Sri Lanka. Guess what? It even has a trapeze! Sri Lanka’s luxury and boutique hotel scene is on the up-and-up, with major brands like Shangri-La opening up to cater to the burgeoning tourist arrivals to this little island in the Indian Ocean. 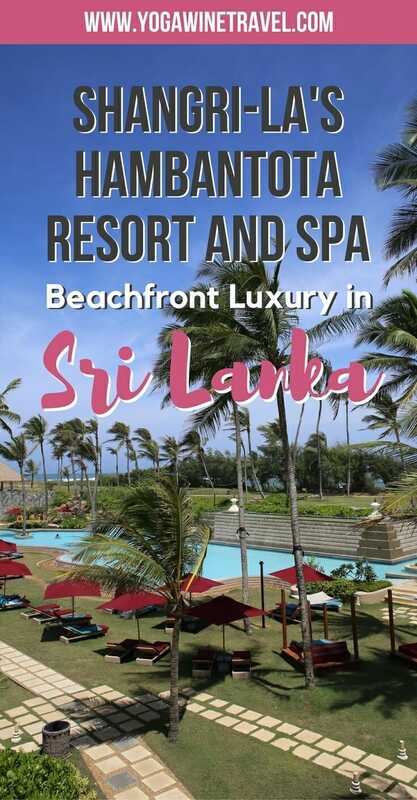 Shangri-La’s Hambantota Resort & Spa opened last June and is the newest luxury venture to open its doors in southern Sri Lanka, and is also the largest resort in country at nearly 60 hectares (or 150 acres). 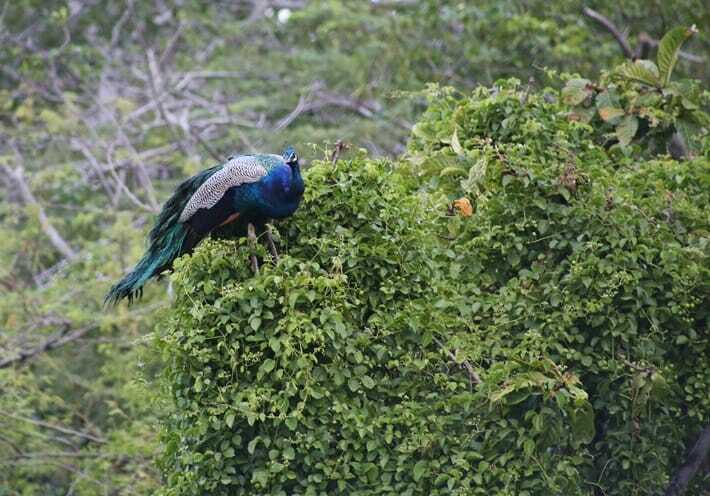 Southern Sri Lanka is becoming an increasingly popular destination for beachgoers as well as wildlife lovers, as it is home to some of Sri Lanka’s top national parks and incredible wildlife; it is also relatively easily accessed from the international airport near Colombo. Accommodation options are also aplenty in this region, and it can be overwhelming when you’re trying to make a decision of where to stay and what to do. If you’ve read any of my previous destination guides and hotel reviews, you’ll know that I’m passionate about promoting boutique travel and unique experiences, and my aim is to be able to point Yoga, Wine & Travel readers to the best of the best. 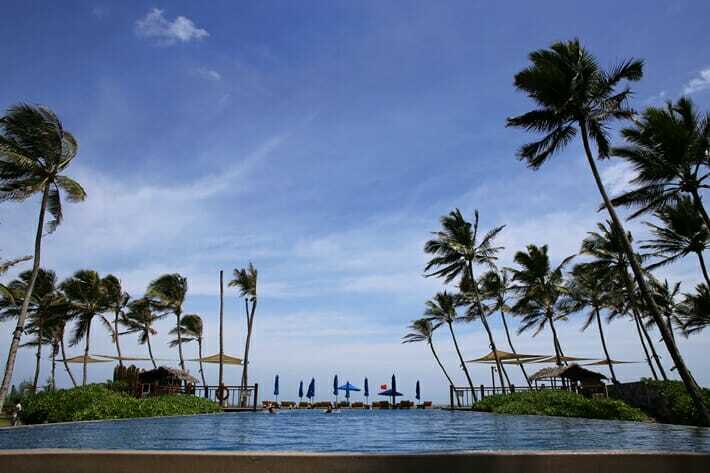 I have stayed at other Shangri-La Group properties in the past and have always been blown away by the beautiful design and level of service, so am excited to share my experience at Shangri-La’s Hambantota Resort and Spa! Visiting Sri Lanka for the first time? Click here for the full list of 12 things you should know before going to Sri Lanka! 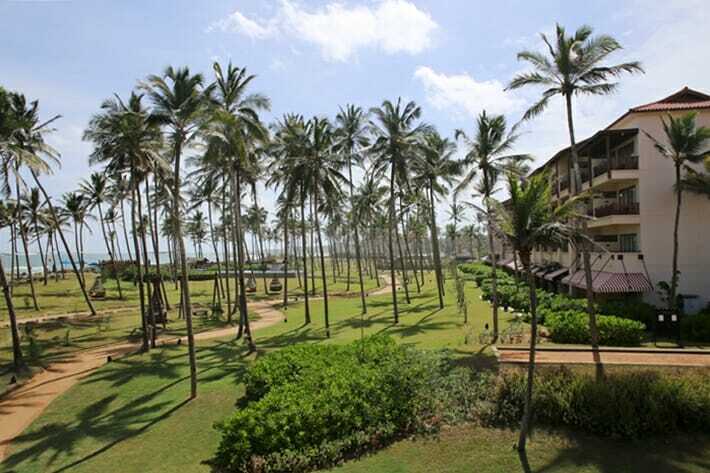 Shangri-La’s Hambantota Resort and Spa boasts 300 spacious rooms, including 21 suites, all offering views of the gardens, lagoon, golf course or Indian Ocean. There are six different rooms types available for different types of travelers, ranging from the deluxe garden room (which, at 516 square feet, is nearly as big as my apartment in Hong Kong!) all the way up to the exclusive Janapathi (meaning “Presidential” in Sinhalese) Suite which has its own massage room and outdoor jacuzzi. Sigh, if only! If the Janapathi suite is too splashy for you, check out the next class of specialty suites which is popular with honeymooners and offers its own kitchenette, or one of the 17 premier suites located around the property. I stayed in the premier ocean view room looking straight across the Indian ocean with a spacious balcony. The rooms are stylishly decorated with lots of warm wood features and splashes of colour, and much like the rest of the hotel is comfortable yet trendy. The bathroom was spacious and provided the basic amenities that you would expect from a hotel of this calibre. My favorite highlight of this room? The panoramic view of rows upon rows of palm trees swaying in the wind with the ocean as the backdrop. The resort offers free wifi throughout the property, and I was extremely happy with the strong connection. Unlike some other hotels, there isn’t a pesky registration or login page and the wifi speed is very fast and stable. Shangri-La’s Hambantota Resort makes it easy to stay active and fit during your stay with an 18-hole golf course, 24-hour fitness centre, yoga classes, beach volleyball, lawn bowling, archery, petanque and bicycle rentals. With the exception of golf and the river safaris, all the other activities are free. For children, there are indoor and outdoor play areas, a trapeze, trampolines, PlayStations as well as a complete water park with water slides. I honestly don’t know how anyone could be bored or run out of things to do at Shangri-La’s Hambantota Resort. Shangri-La’s signature 18-hole golf course was designed by Rodney Wright and is set amid a vast coconut palm and pineapple plantation. 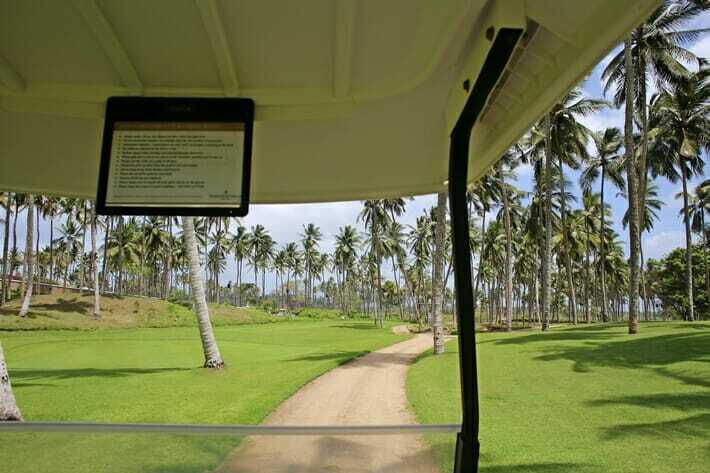 Though it is hot in this part of Sri Lanka, you can stay cool with the ocean breeze and zip around on one of the hotel’s golf buggies. All 55 golf caddies have been trained by the hotel’s director of golf who hails from France originally, and he also hosts golf discovery sessions for anyone (kids included) who is new to the sport. If you’re in the “no idea how golf works” club like me, head straight to one of the hotel’s pools. The hotel is home to not one, not two, but THREE pool areas. The sunset pool is the perfect place for a sundowner cocktail or two (try the white sangria), before you mosey on over to one of the property’s restaurants for a delicious dinner. 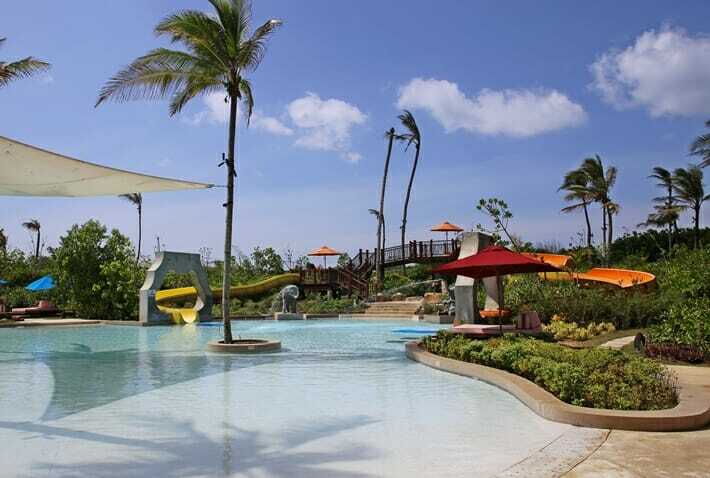 The lagoon pool is a long winding pool that’s perfect for families, and kids have their own dedicated pool area to splash around in. The hotel also offers access to a long stretch of sandy beach which is perfect for a stroll and dip, but only during the peak season from November to around February. During the other seasons the ocean can be quite choppy with lots of rip currents. 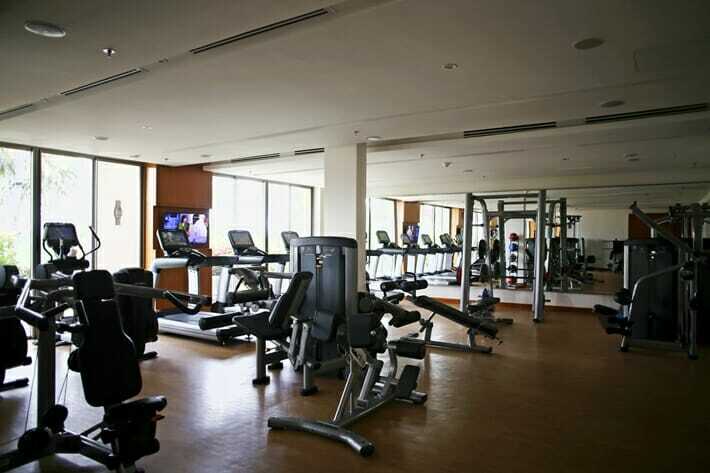 The 24-hour fitness centre offers a plethora of treadmills, stationary bicycles, mountain climbers, weight machines and free weights and can easily be accessed using your room card. Yoga classes are hosted twice a day, 5 times a week in the open-air pavilion. I attended a class with the in-house teacher and found it to be a challenging, fast-paced class which may be more appropriate for people who have attended a few Vinyasa-style classes and are already familiar with alignment. The pavilion is slightly unfortunately located next to the kids water park so can get a little noisy, but it’s a great opportunity to become more aware of your own body and practice stilling the fluctuations of the mind. 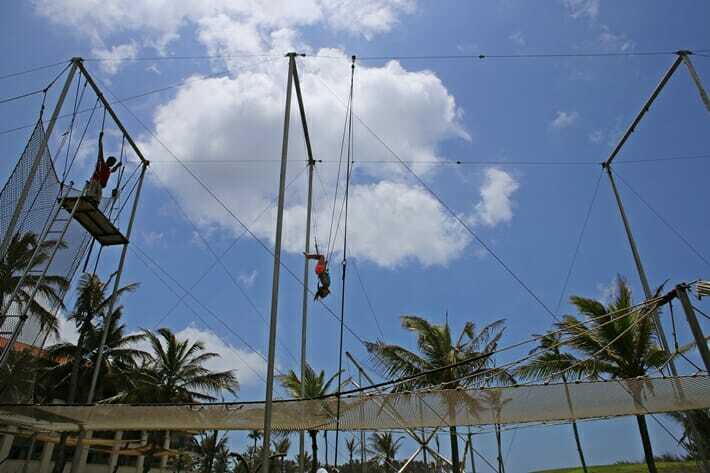 When is the last time you visited hotel that had its own trapeze? I had never tried it before and have a deadly fear of heights, but managed to go on it (twice) and even hooked my knees over the bar and let go of my arms on my second try! It’s a truly exhilarating experience for adults and kids alike, and I would highly recommend that you give it a crack. If the trapeze is a no-go, you can always go for a bit of a hop on the trampolines. Sri Lanka is famous for its Ayurvedic treatments and Shangri-La’s Hambantota has been quick to embrace the tradition. Head to the spa and relax in one of their 12 treatment rooms for a Chinese or Ayurvedic treatment using 100% natural spa products. You are also given the opportunity to consult with an Ayurveda doctor and they will prescribe a treatment to help with any specific issues you are dealing with: for example, I had been suffering from a bad case of bronchitis for weeks and weeks, and to help soothe the ailment my masseuse used an Ayurvedic oil and focused mainly on my chest area and upper back to target the lungs. If you’re traveling with children, you are given a warm welcome at the resort so you can enjoy your time together as a family. There is a kids club with plenty of activities to keep your children engaged, a drone flying area, outdoor water park complete with water slides (to be fair this is great for adults too), childrens’ pool and childcare facilities. If you’re anything like me and shudder at the thought of a screaming infant, fear not! 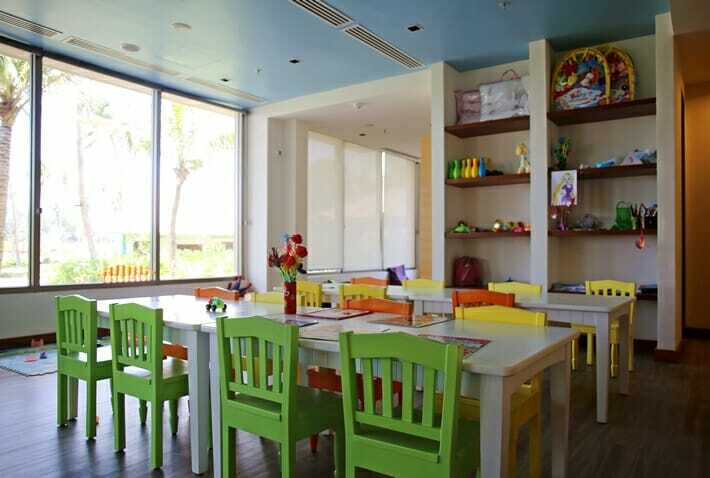 Most of the children’s facilities are located in the east wing, and Shangri-La goes the extra mile to accommodate honeymooning couples and adults without children in the west wing. Click here to book your stay at Shangri-La’s Hambantota Resort & Spa! 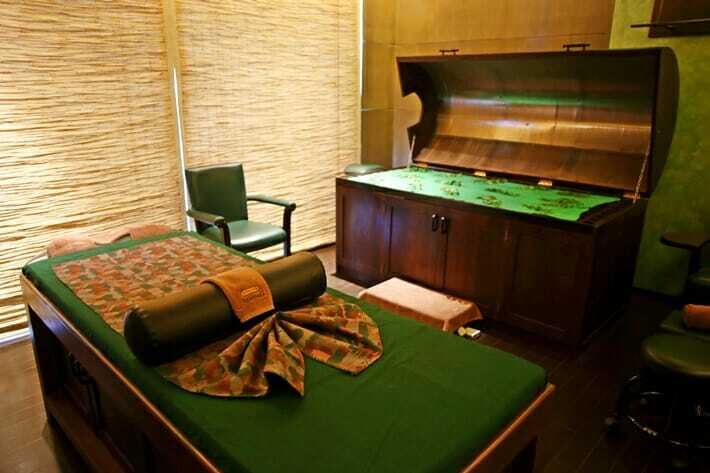 For any unexpected medical issues the hotel also has its own on-site medical clinic staffed by a practicing nurse. 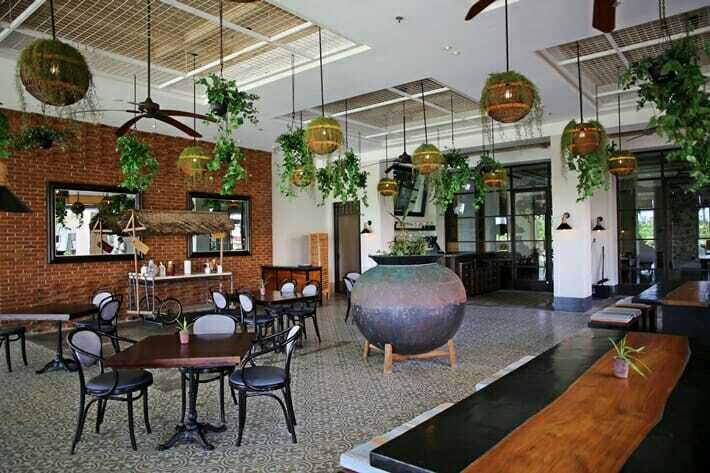 Quite possibly one of my favourite features of the hotel, Shangri-La’s Hambantota Resort has set up a local artisan village to help support the community of artists and craftsmen. 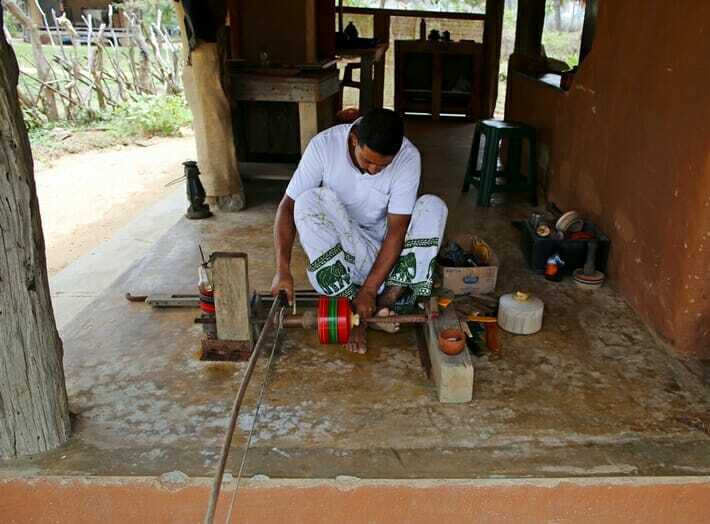 This CSR initiative doesn’t charge the artisans any rental or commission, and enables them to set up shop to exhibit their handicrafts and for guests to learn a little more about this aspect of Sri Lankan culture. 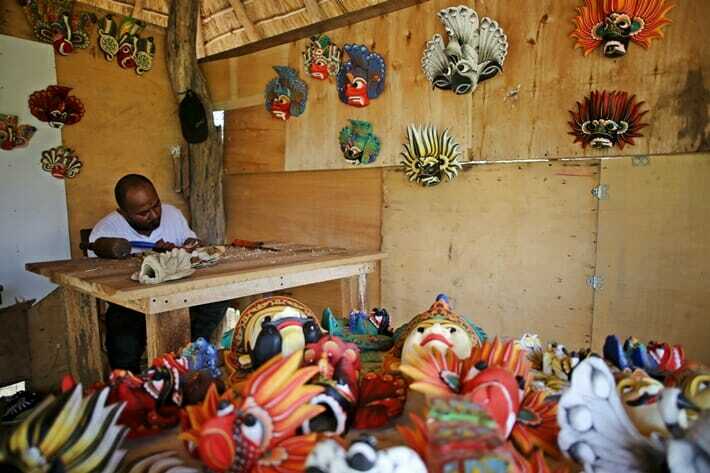 You’ll find mask makers, batik artists, painters, ceramists, and even a Laksha craftsman who hand carves wooden boxes and applies a coloured lacquer to decorate the container. The lacquer is made of a special type of beetle excrement – yes, you read right, excrement! 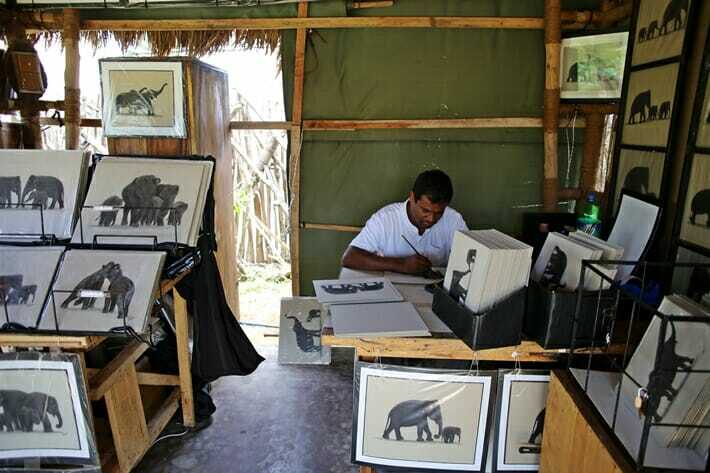 The art is a rare one in Sri Lanka and is passed down through generations, you can even try your hand at it, but it’s much harder than it looks. Don’t say I didn’t warn you! Shangri-La’s Hambantota Resort & Spa offers a variety of exciting dining establishments: Bojunhala serves local Sri lankan food and international dishes, while the stunning Sera, inspired by the famous hawker stalls of Southeast Asia, provides a variety of comfort foods from the streets of Thailand, Singapore, Malaysia and China. 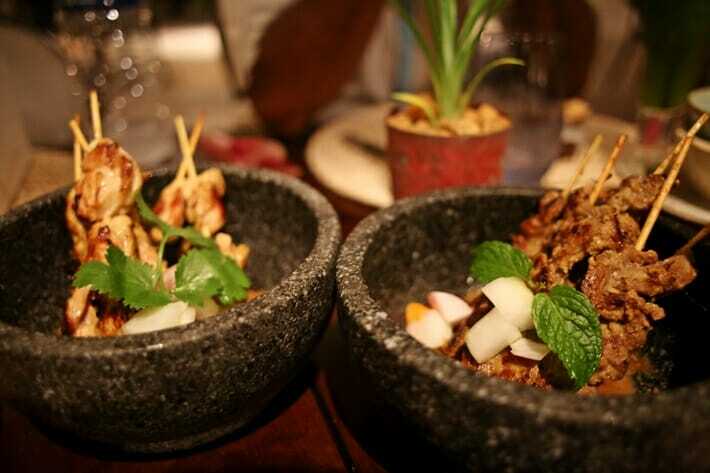 Make it a point to try their nasi goreng, coconut creme brulee and beef rendang curry! 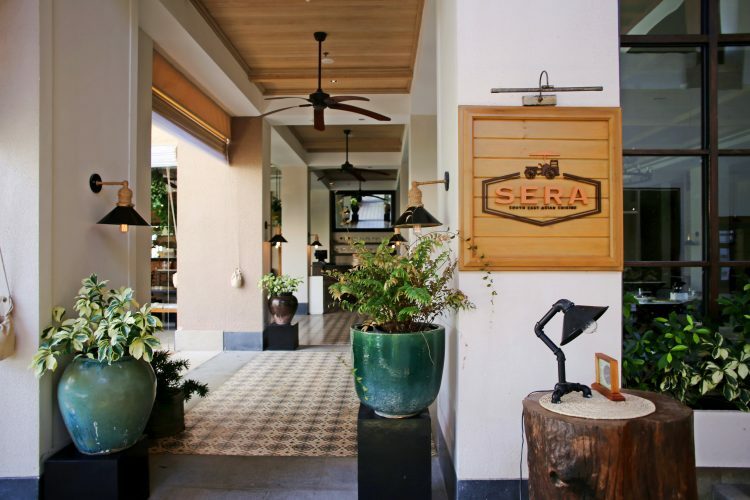 Twice a week Sera also sets up an outdoor hawker centre (as of August it is held every Tuesday and Saturday) so that you can immerse yourself in the food market experience. 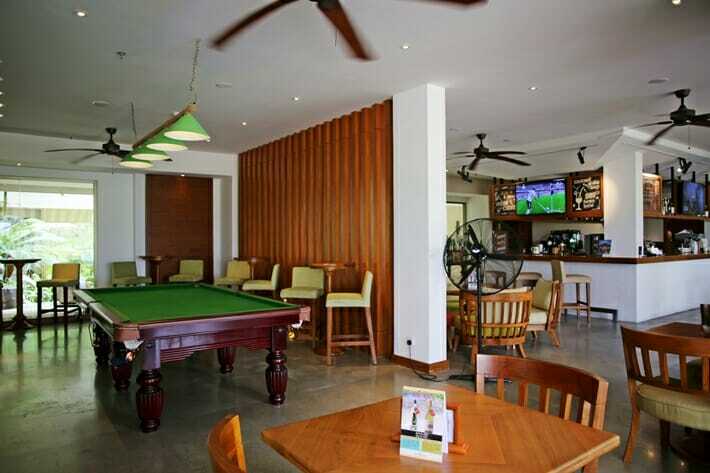 Two additional dining outlets to check out are Ulpatha sports bar which is located in the Golf Centre and offers a special grill menu and classic favorites like the club sandwich, and Gimanhala lobby lounge which serves high tea and an array of cocktails. 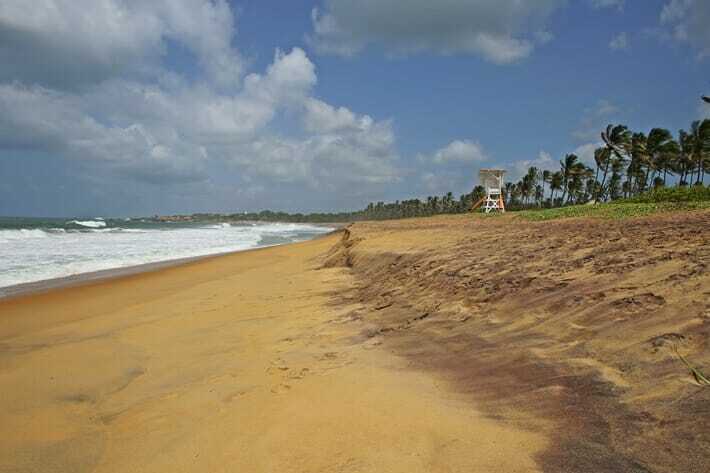 Hambantota is not typically high up on travelers’ lists of places to visit in Sri Lanka, but it does have a long history as the centre of a prospering civilization in Sri Lanka and an area that played an important role in nurturing the Buddhist culture. 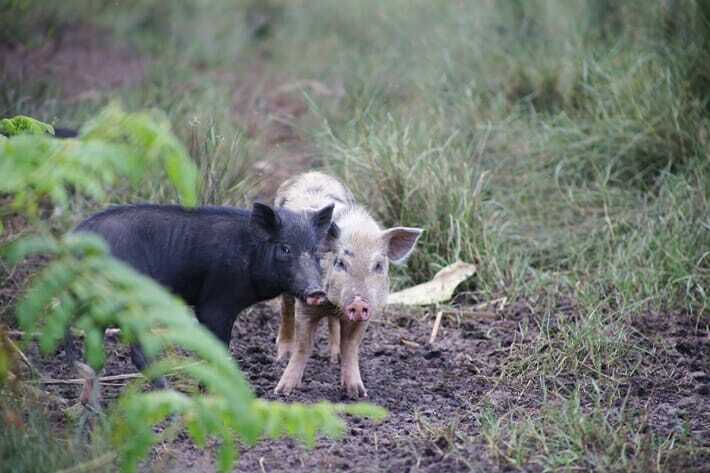 It is also a fantastic place to base yourself if you want to explore Yala National Park or Udawalawe National Park for a wildlife safari, and you can also organize a river safari to spot some crocodiles and rare birds. The hotel is also able to organize a cycling excursion to the nearby Godawaya, a small fishing hamlet which once was a part of the ancient Silk Road. For even more ideas head over to my guide to Sri Lanka’s south coast. Depending on your port of arrival, your journey to the resort can take anywhere from 45 minutes to 4 hours. Located just 35 kilometres south of Shangri-La’s Hambantota Resort & Spa, Hambantota Mattala Rajapaksa International Airport is currently serviced by UAE carriers FlyDubai on a daily basis and Rotana Jet twice a week (Friday and Sunday). Other international flights are served by Colombo International Airport, 240 kilometres away from the resort. The hotel provides airport transfer services from both Sri Lankan airports. If you’re feeling fancy and can’t stand the idea of being in a car for 4 hours, you can also opt to take an air taxi from Colombo International Airport via Cinnamon Air. Hotel guests receive a special discount when booking this service. 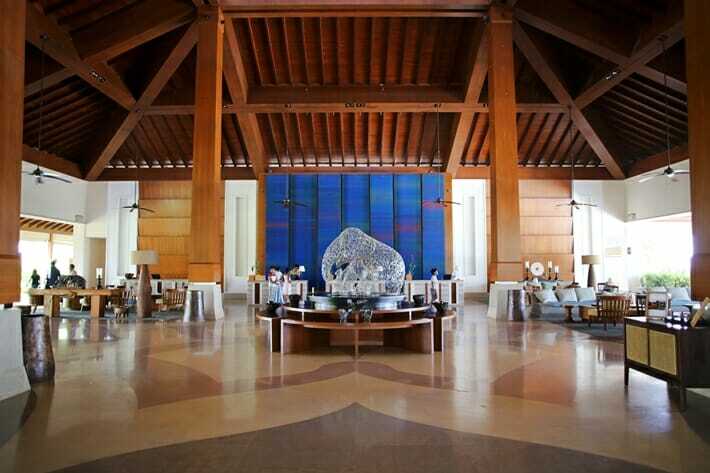 Click here to book your stay at Shangri-La’s Hambantota Resort & Spa! True to Shangri-La’s reputation, the service and hospitality at Shangri-La’s Hambantota Resort is top notch, and no request is ever too big nor too small. 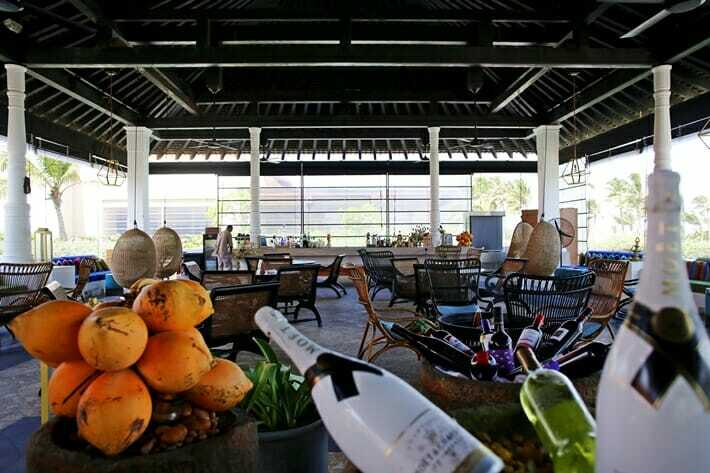 Shangri-La’s Hambantota Resort is a fantastic place to unwind and relax, yet still stay active and get involved in all the activities the hotel offers. Whether you are a solo traveler, couple or family with children, Shangri-La’s Hambantota Resort offers an explosion of experiences in a beautiful part of Sri Lanka. 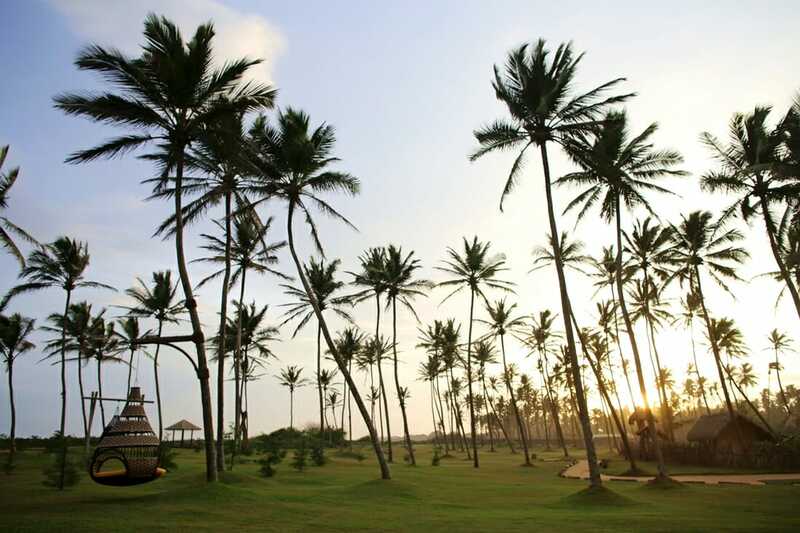 Click here to book your stay at Shangri-La’s Hambantota Resort & Spa! 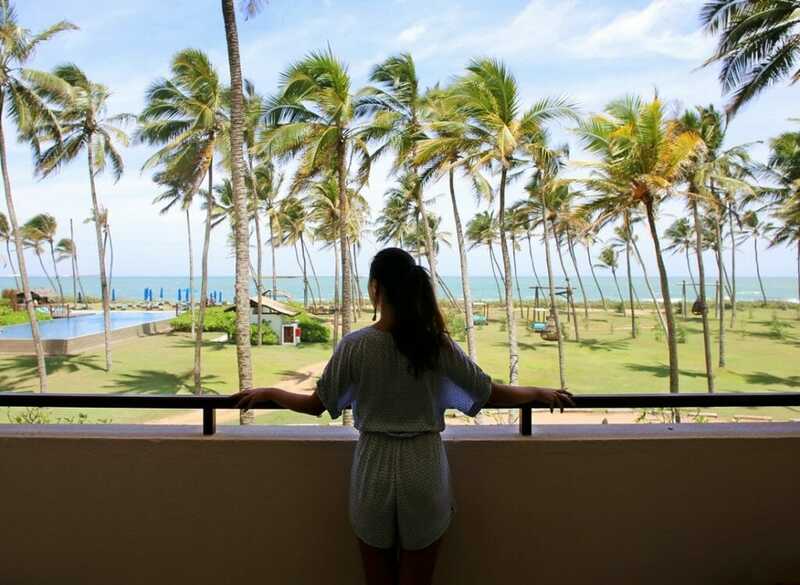 My stay at Shangri-La’s Hambantota Resort was sponsored; however, no compensation was received for this review, and as always, the opinions on Yogawinetravel.com are (and always will be) my own! Wow, there’s so much to love about this hotel! The rooms look super spacious and i love the cultural nods! I recently got into golf so that course got me very excited, as did the yoga classes. I was in Sri Lanka last year but maybe I’ll have to go back, just to stay here! I think the artisan village is one of my favorite features! I really hope you make it back to Sri Lanka, it has so much to offer! Looks like a luxury dream. I would love to be at this sunset pool trying the white Sangria now! Or one of the other two pools would be fine as well haha I love that they have so many possibilities to stay active during your stay but in the end I’d probably just enjoy the sun and the pool anyway 🙂 thank you for sharing this! That sangria packed a punch, that’s for sure! I definitely wasn’t expecting to get involved in so many activities during my stay, but I’m glad I did! What a great hotel! Who would have thought there would be a trapeze. Love the three pools – esp one for kids. Great review and photos too. That presidential suite would be fab. ??? When I had read there was a trapeze I was imagining a little kiddie trapeze, not a full-blown one! The rooms are fantastic, I hope you get to visit soon! Wow the resort looks fabulous. 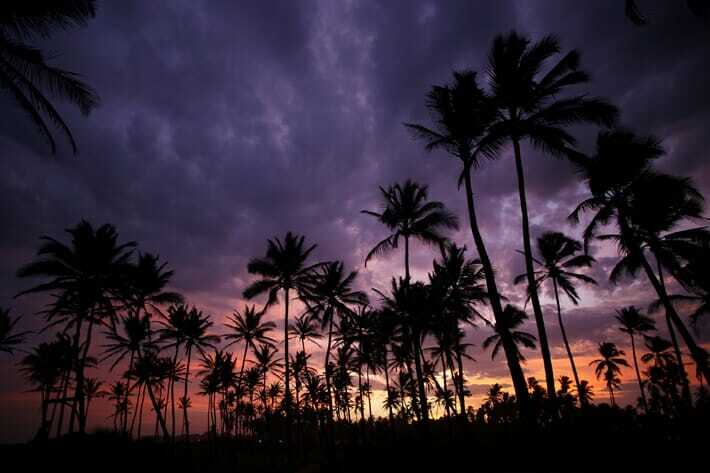 I just love all the palm trees. I could probably just spend all day at that pool. I tried to count the number of palm trees but stopped after 20 or so! I think you’ll need at least a week to try all those amenities. I personally would love to visit the Artisan village as I’m really interested to learn about other cultures’ art. Glad that they offer help to the local artists. I ended up doing everything in 2 days, but I really wished I had more time there to spread it all out! If I had enough suitcase space I would have brought a few pieces home! How luxurious! I would love to stay in a resort like this, so many things to do and see. It’s almost like its own amusement park. Exactly! There is no shortage of fun activities, I only wish I had a few more days there! Wow looks amazing, so luxurious! Sri Lanka is actually my next travel destination (at least I still have to book it haha, but I really wanna go). I will check them out! 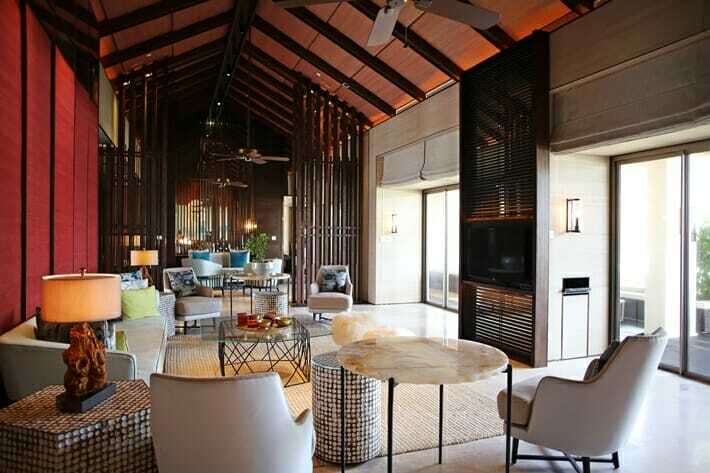 Eventough I prefer the little bit less luxurious places, little beach bungalows but it looks really amazing! I love your review. It’s always good to hear the good and the challenging. I love the Indian Ocean but have never been to Sri Lanka. One day… I hope. 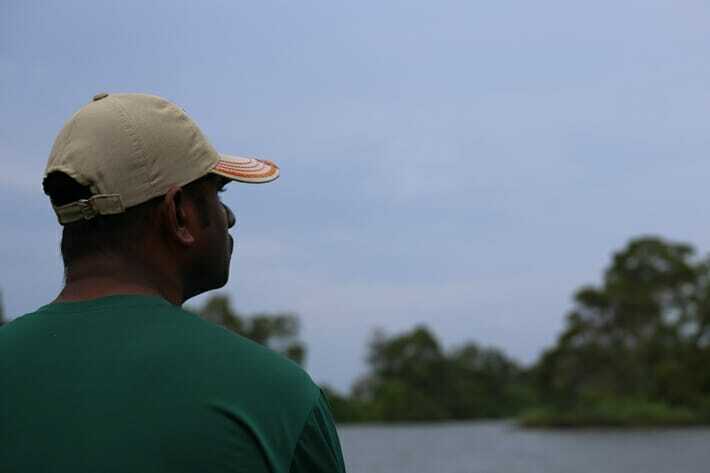 Sri Lanka is a fantastic country – hope you make it there one day! I totally expected kiddie-sized trampolines and trapeze, but no – they’re full blown proper ones! Sri Lanka seems like a wonderful country. Recently I have met some people from Sri Lanka and they are always so kind and nice to talk to. Thank for the tips. It’s a fantastic country – hope you get to visit one day! I’ve never been to Sri Lanka before but I’ll definitely be going in the near future. This resort and spa seems amazing, they really have it all! I’d love the yoga classes, the spa and the artisan village! What a great place to stay!! I think I just found my place to stay when I’ll finally get a chance to visit haha. This looks absolutely gorgeous! Multiple pools, beachfront, and freaking trampolines?! They’ll have trouble to get me outta there! 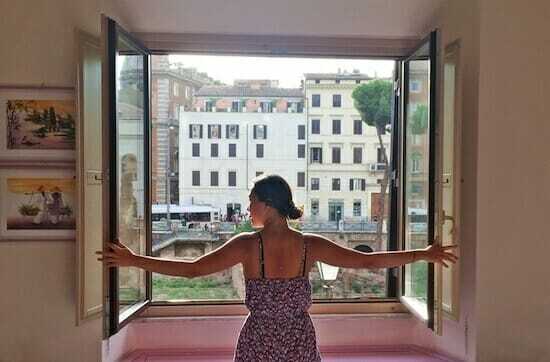 I was so devastated when it was time to leave! This place is amazing! There are so many rooms, I was surprised it’s so big! Very pretty views. The golf course takes up a large chunk of the space, but the residential portion is pretty sprawling as well. I dunno if I would have been game enough to try that trapeze! Gotta love any hotel that offers yoga classes. Am yet to stay in a Shangri-La anywhere in the world – this one looks like it would be a good place to start! This is definitely a great taster of what Shangri-La offers – the service is always outstanding! Woah! 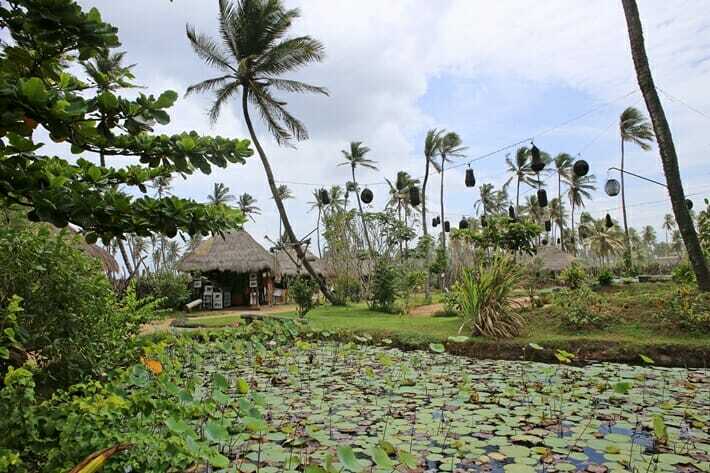 60 hectares of luxury resort? How amazing. 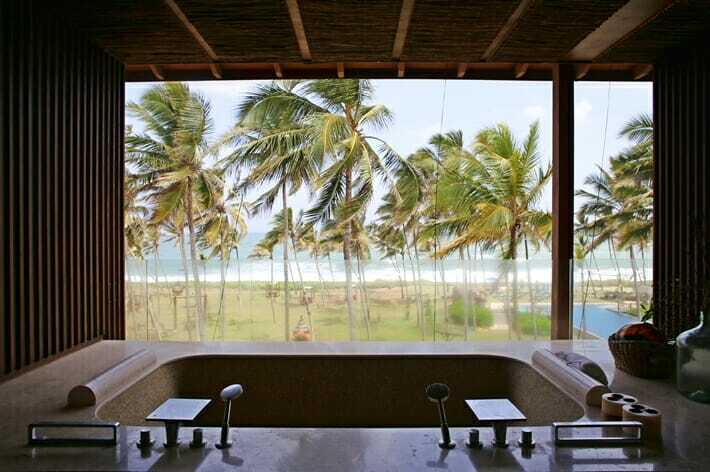 The view from your bathroom looks incredible – beach front views with the palm trees – oh how amazing. And who would have thought to add a the trapeze! How cool is that. I would love to try that one day. I’d love to visit this resort one day. I love the dark wood decor in the rooms, but I’m afraid if I stayed there I might never leave the room! (I have a bad habit of doing that in nice hotels, lol!) This places looks amazing! I haven’t been to Sri Lanka, but this looks like a great relaxation destination! I was actually SO sad to leave – the next time I visit I’m going to stay for a full week! 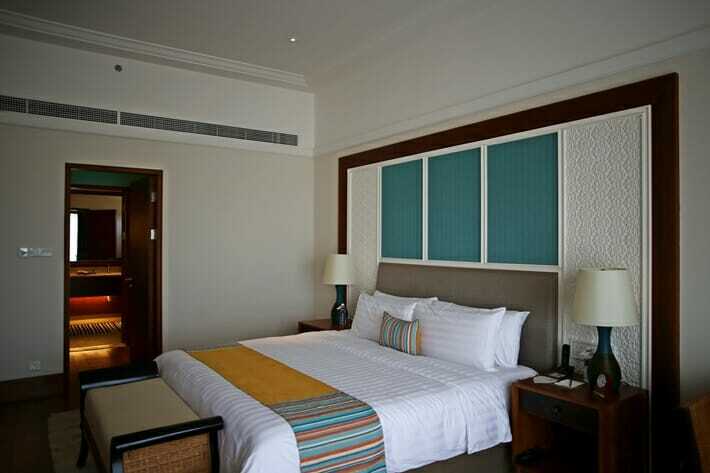 Shangri-La’s Hambantota Resort and Spa looks amazing ! So big, luxury and beautiful. 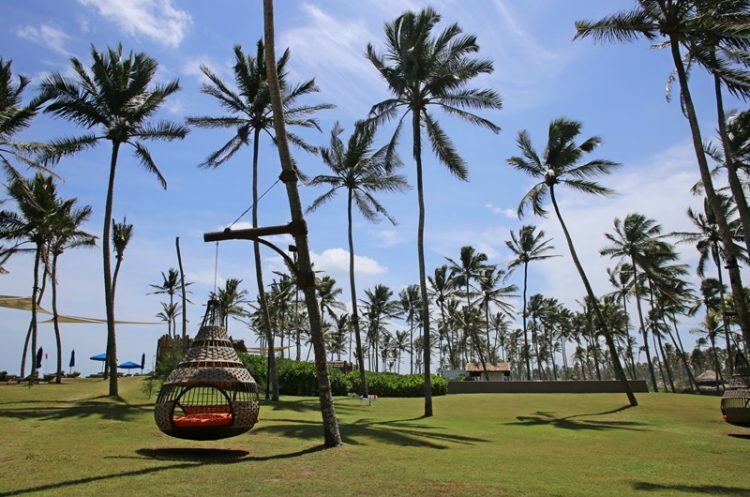 I can already image myself laying down on that basket chair between those palm trees! 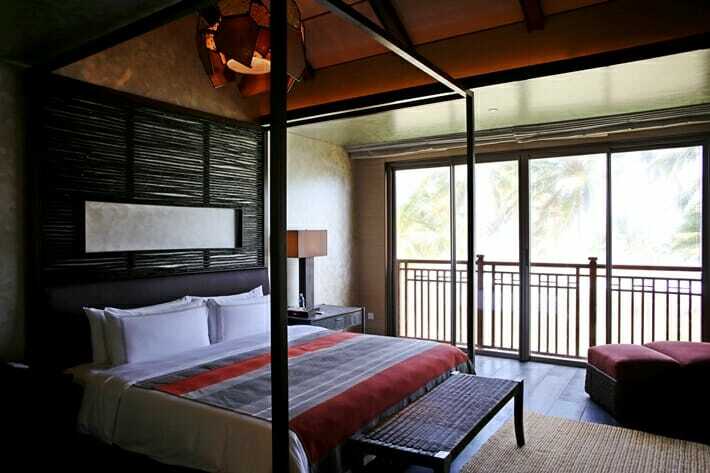 I cant wait to visit Sri Lanka one day and I would love to stay in Shangri-La’s chain! They have such an amazing hotel in London too! There are plenty of basket chairs so you’ll never have to worry about not getting one! Your stay at Shangri-La looks amazing, I am floored by the luxuries view. I would love to pamper myself by staying a night there. The view of rows and rows of palm trees is a highlight, that’s for sure! The resort looks fabulous. Beautiful views and nice hospitality. I could probably just spend all day at that amazing pool. And if you get tired of one pool…just go to another! The great thing is that there are so many options. This looks incredible! I stayed at the Heritance Kandalama when I was in Sri Lanka, loved that resort too. 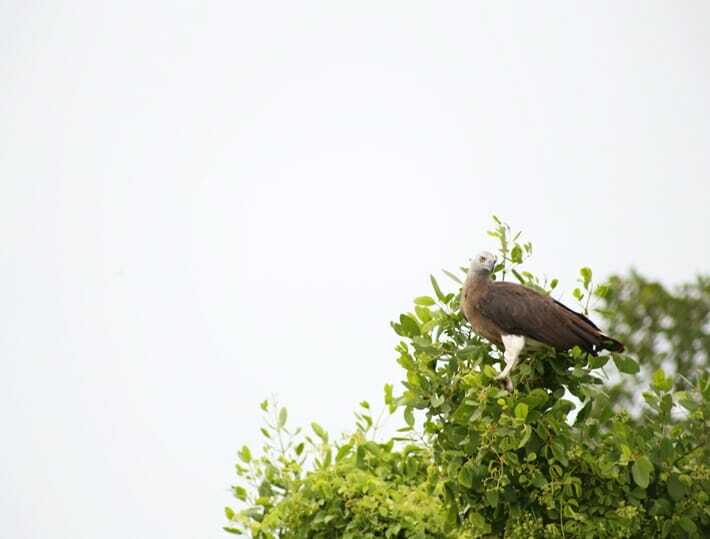 Did you climb Sigiriya Rock or Pidurangala? We stayed there as well – the AC was such a godsend after the climb! Wow!! 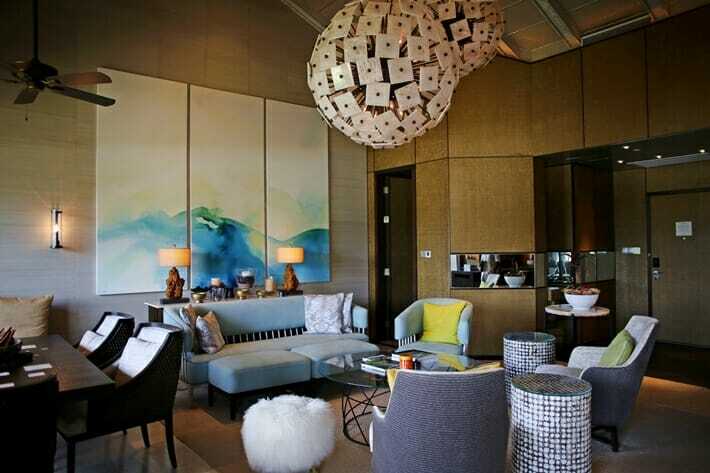 This place looks amazing… I’ve never stayed in a Shangi-La Hotel but its always been on my wish list. Best of the best! 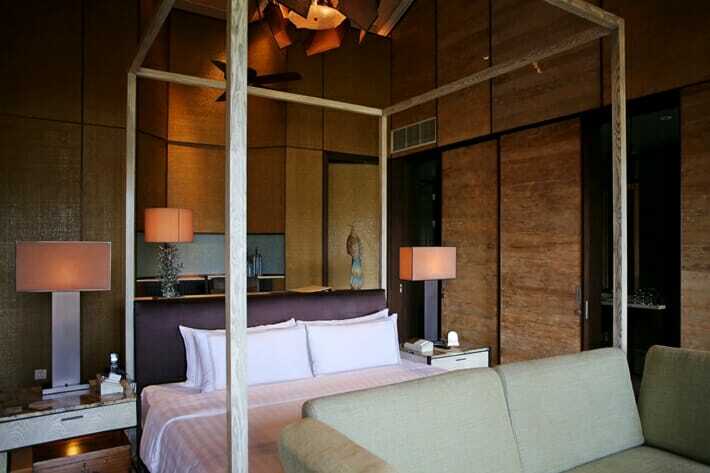 Shangri-La properties are always super classy – I hope you get to experience the Shangri-La treatment soon! This resort looks amazing! I would love to stay there sometime. I haven’t made my way to Sri Lanka yet but bookmarked this for when I do. Please let me know if you make it over! 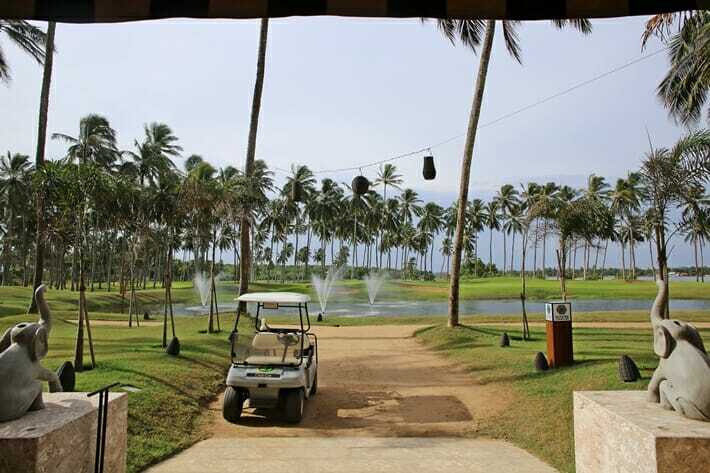 You’re never bored at the Shangri-La Hambantota – next time I’m going to take a few more golf lessons! 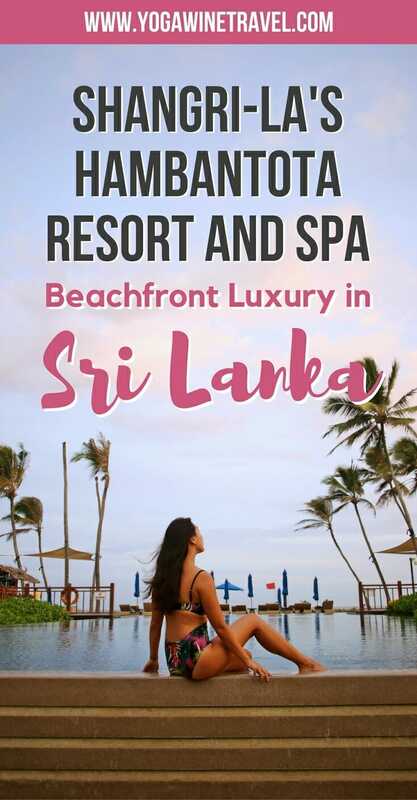 The Hambantota Resort & Spa by Shangri-La looks like the perfect place to stay whilst visiting southern Sri Lanka. I love they have all those childrens facility, I know where to stay if I take my daughter! James, your daughter would LOVE it! There are so many children’s facilities to keep them occupied. 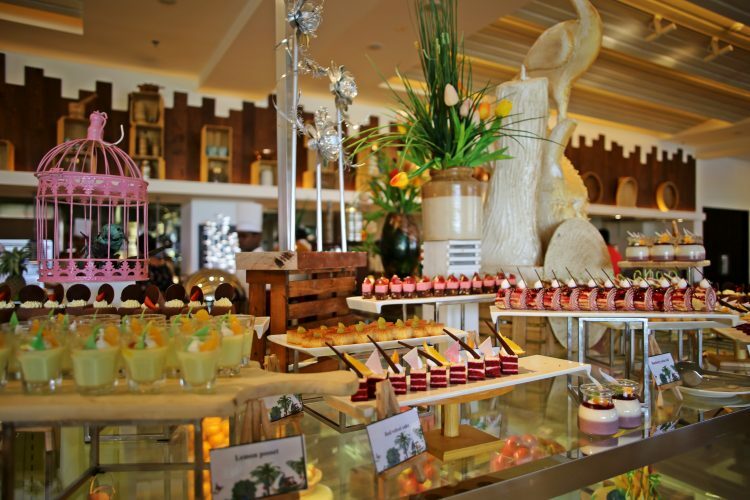 Staying in a Shangri-La hotel is always a treat no matter where in the world.. lucky you! Thanks for taking the time to read this review! OMG, this is just the kind of luxury we love during our travels. We would book Shangri-La in a heartbeat if we ever plan to visit Srilanka for it has everything one could need for a peaceful stay! Super classy! It’s an incredibly elegant and classy hotel, but still maintains a sense of fun. I hope you get to stay here, Harsh! I mean yet again, major envy when I see anyone staying at a Shangri La! That bathtub with the A+ views looks amazing! I’ve been more and more interested in visiting Sri Lanka recently as well! looks like an amazing destination to explore! There are SO many things to see and do in Sri Lanka, I hope you make it there one day Chiera! I’ve never been to Sri Lanka and certainly wouldn’t have thought of it as boasting such luxury. 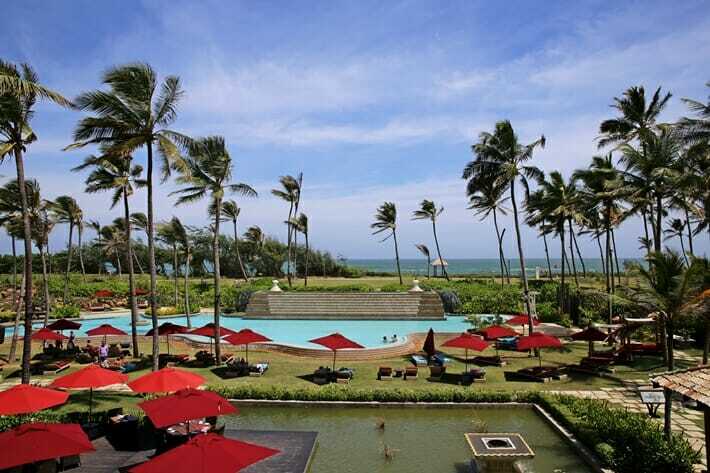 But Shangri-La’s Hambantota Resort certainly seems to offer everything you could want! There are several world-class luxury hotels here – Cape Weligama, The Fortress, Ceylon Tea Trails, and Shangri-La just opened another hotel in Colombo! Ok, ok, I was hooked once I read about the Trapeze and Artisan Market so I’m in! Now I just need to plan a trip back to beautiful Sri Lanka! Come and visit! Next time you should definitely visit tea country. How could you not enjoy your time at that resort? It’s absolutely gorgeous! I can almost feel the breeze blowing through the trees in that photo. My only problem would be what to do first! The views are absolutely gorgeous! The design aesthetic is totally up my alley, too. You know what’s funny? The palm trees are so much thinner than they are in LA – I know, so random. I would not have guessed that haha. They must be another species?